NEW ORLEANS -- A New Orleans man is offering $3,500 for return of the silver trumpet stolen during the funeral for his brother, a rising 28-year-old jazzman called "Trumpet Black." Travis Hill died on tour in Japan, from a dental infection that reached his heart. He was a grandson of R&B singer-songwriter Jessie Hill, best known for the 1961 hit "Ooh Poo Pah Doo," and a cousin of Troy "Trombone Shorty" Andrews. The trumpet was the family's only physical token of "Trumpet Black," his brother, Leroy Hill, 30, told The New Orleans Advocate. "That's my brother," Hill said. "He said that trumpet is his life." Leroy Hill presented it to their mother during the funeral May 23. He said relatives grabbed it from a stand, the jazz funeral paraded through Treme, and the trumpet has been missing since. 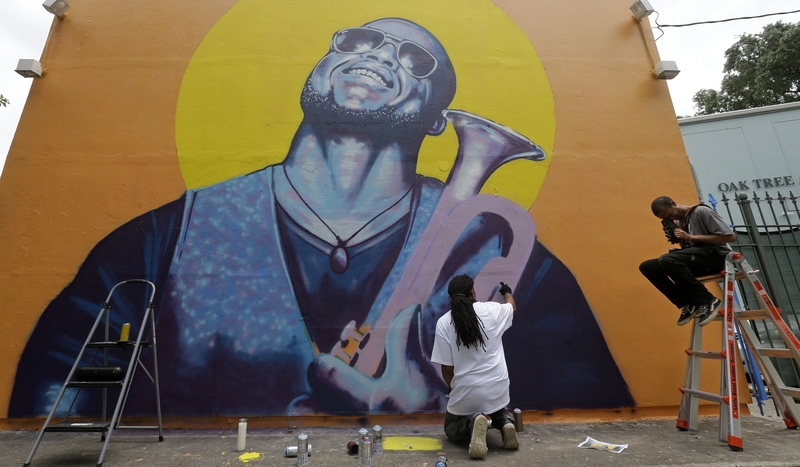 Travis Hill's casket was carried about a half-mile to a mural bearing his portrait and back to the family's Ooh Poo Pah Doo Bar, a block and a half from the theater, Nola.com ' The Times-Picayune reported at the time. Hill said he realized the trumpet was gone the next day, and filed a police report May 26. "I think somebody stole it, truthfully," Hill said. "Maybe they stole it because they think they can sell it down the line. Or maybe they stole it just to keep it, to say, 'I have Travis' horn.'" Travis Hill had performed with the Trombone Shorty Brass Band and with groups including the New Birth and Lil Rascals brass bands before spending nearly nine years in prison for armed robbery. He got out in 2011 and was soon working again as a musician. He played with a number of groups including his own band, Trumpet Black and the Heart Attacks. Leroy Hill said he has asked many times for updates on the police investigation, but all he has heard is that surveillance video of the funeral was destroyed. An NOPD spokesman, Officer Garry Flot, said he could not comment on the status of the investigation except to say "detectives are investigating the incident to determine the whereabouts of the trumpet." Hill said he had unsuccessfully begged management of the Carver Theater, where the service was held, for a copy of the video. Carver operations director Shelley Everett said the footage had been reused by the time police requested a copy. She said she had looked at it herself before then, and "all you could see was a bunch of people." "We had a sea of all kinds of instruments walking out that door that day. ... It's a shame someone would do that to the deceased and the family, but people do things," she said. Hill said, "she should have let the professionals handle it, whether it was inconclusive or not."